Here's the Torchwood team and friend. 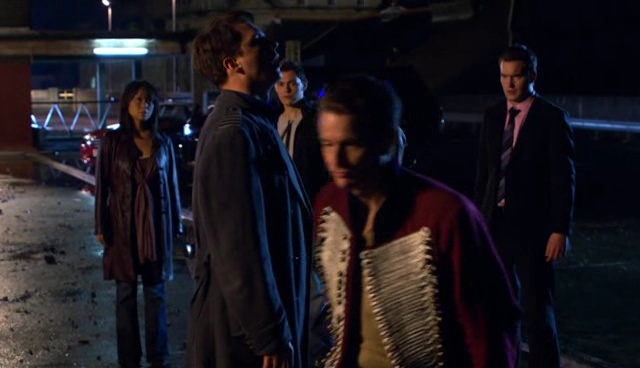 That's Tosh, Captain Jack, Owen, Captain John and Ianto (possibly with Gwen behind Cap'n John). What, though, is the caption, captain? The team were somewhat baffled to discover they had accidentally wandered onto the set of Sharpe. Zebras deserve everything they get. "Oooh...bright shiny lighty spaceship type thingy....No, hang on, it's a street light...."
I wish I was a glow-worm,a glow-worm's never glum,it's hard to be unhappy when the sun shines out your bum! "You have often said... pass"